History is melting down, courtesy of a multi-century plot to bring the Transitive shape-shifters to power. Only Time Rover Jacynda Lassiter can set things back on course, but that will be difficult. She's been abandoned in a Victorian insane asylum with no memory of who she is. Her two Victorian friends are facing equal difficulties: Dr. Alastair Montrose is caught between his duty to uncover the truth and powerful foes who wish it buried. Once lauded as a hero, Detective-Sergeant Jonathon Keats is on the run, framed for a woman's heinous murder. Keats' arch enemy, Desmond Flaherty, can prove him innocent, but the Fenian isn't about to come forward, not with the life of his only daughter on the line. If the anarchist's cache of explosives ignites the biggest conflagration since the Great Fire of 1666, the future will change. 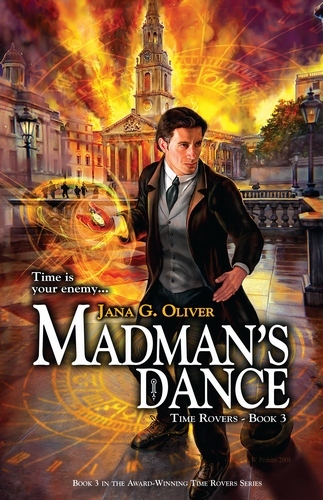 There will be no sanctuary from the Madman's Dance. Jana Oliver is an Iowa native who now enjoys the sunny winters in Georgia. She's been a nurse, a travel agent, farmed with draft horses and lived in Hong Kong. Once the writing virus caught up with her, it hasn't let loose since. "It was like flipping a switch," Oliver explained. "I went from not writing anything to absolutely consumed by the need to put the stories on paper."